Today’s trick-or-treaters may not know the serious origins of this fun-filled tradition. Their masks and costumes began as disguises for All Hallows’ Eve (now Halloween), the time when ghosts, demons, and other supernatural creatures supposedly could slip easily from their world into ours. If such creatures could not recognize a disguised person, they could not harm that individual. And—if someone put up a bold front, with a fierce attitude and frightening costume—perhaps supernatural ‘bad guys’ and other villains might themselves be scared away! Today I look at two graphic novels that successfully play with our ideas about heroes and villains and also upend our notions of what is natural vs. supernatural. 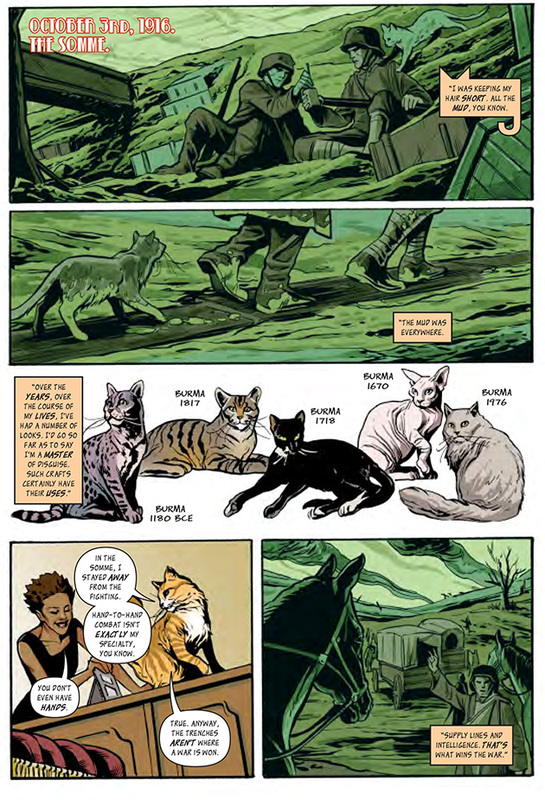 I Was the Cat (2014) entertains readers by making the familiar strange, while Digger: The Complete Omnibus Edition (2013) ‘wows’ us by making the strange familiar. Neither is specifically a Halloween read, but I think these books are as spooky as many ghost stories, with thrills and chills that rival October’s haunted houses and hayrides. Readers tween and up will best get the verbal exchanges, interpersonal dynamics, and historical or cultural references in these graphic works. 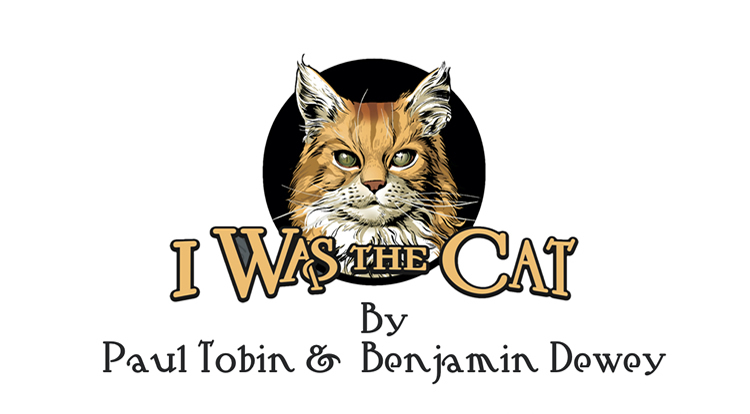 Author Paul Tobin and illustrator Benjamin Dewey confound our expectations in I Was the Cat. Traditionally, cats (or other natural creatures such as bats, crows, or owls) are secondary characters in tales about witches and wizards. These creatures are the so-called “familiars” whose presence helps magic-using humans supposedly achieve their goals, whether for good or evil. Yet in I Was the Cat it is a furry feline named Burma who is the central, seemingly magical character—and an evil, criminal mastermind to boot! If we do not accept Burma’s explanation for his ability to speak many human languages (he says merely that he is “one of a kind”) only magic remains as the explanation. This book’s old-fashioned cover image, though, repeated as its frontispiece, contains clues for the knowledgeable reader. Steely-eyed Burma is depicted in the style of 17th and 18th century conquerors or wealthy merchants, with one paw dominating a globe, his triumph over time indicated by an hourglass, watches, and clocks. Stray bullets, knives, and coins suggest the methods he has used to achieve his success, while a cat’s skull (typically a human one in such paintings) suggests that only death will finally conquer him—but in Burma’s case, only after an extraordinary succession of nine scheming lifetimes. The details here bear out Tobin’s praise of illustrator Dewey’s attention to historical detail for the array of time periods covered in this book. We see Burma in ancient Egypt, in Elizabethan England, in the France of storyteller Charles Perrault and later of Napoleon, in the England of 18th century criminal Jonathan Wild, and in the European trenches of World War I. Later, when Burma realizes that “cinema stars” are the new world rulers, we even see him on the movie set of Audrey Hepburn’s “Breakfast at Tiffany’s” and a series of James Bond thrillers. Bond’s arch-enemy Ernst Blofeld, often shown cradling a cat, is in this novel actually holding Burma in disguise! Illustrator Dewey effectively uses a distinctive, unifying color palette for each different time period or setting. Drama in this novel is heightened by Dewey’s varying the size of framed images, with many close-ups and a few panoramic shots from a cat’s perspective on the floor or in a cushioned chair. The reader’s attention is refreshed and refocused by some mid and long-distance shots drawn as unframed black-on-white silhouettes. One remarkable full page image shows all the people and plots contemporary Burma now commands, as multiple images from a variety of settings swirl around the central, mastermind Burma, who is updating his minions by speakerphone. Will this fiendish feline succeed in his plans? 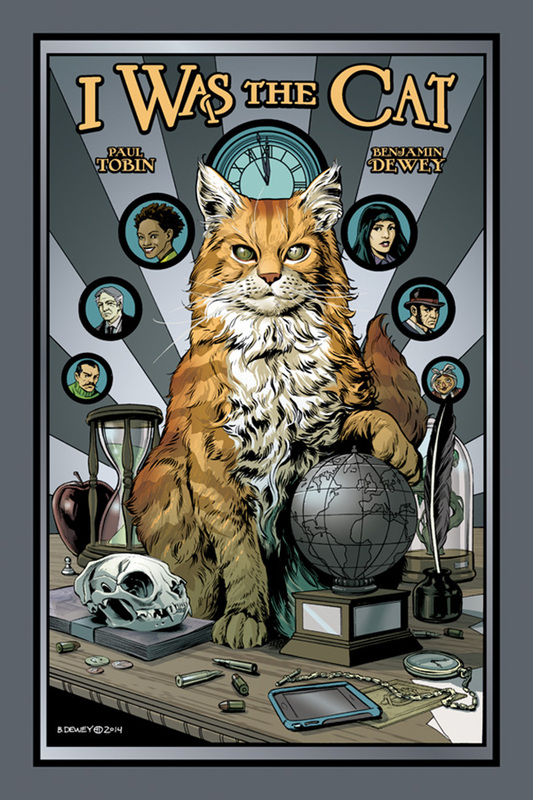 As Reggie and Allison speed towards the book’s conclusion, Reggie imagines the worst: a full-page panel filled with devastating robotic cats, space-suited felines, and even cat-shaped transformers blasting everyone and everything in their path. Yet I Was the Cat ends on a more ambiguous note: with cats twining around the feet of unsuspecting people in a bustling downtown square. Tobin and Dewey display devilish good humor as they toy with readers’ expectations in this novel, much as a cat might play with a mouse. 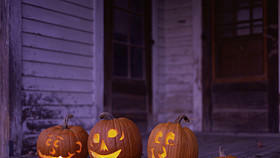 Those who enjoy the thrills-and-chills of Halloween celebrations will enjoy this game. Others, including younger readers, may better appreciate the more traditional and tender depiction of a cat’s nine lives in Lloyd Alexander’s classic, non-graphic novel Time Cat (1963). While cats exist world-wide, fewer readers will have first-hand knowledge of author/illustrator Ursula Vernon’s animal protagonist—a native-to-Australia wombat. The fantastic adventures of “Digger” (short for “Digger-of-Too-Convoluted Tunnels”) were a popular, serialized webzine for more than eight years before they also began appearing as individual, in-print volumes. Readers took this burrowing creature—depicted by Vernon as a sentient, matter-of-fact engineer, who has somehow dug her way into an even more dangerous fantasy realm—to heart. With its recent publication in an omnibus edition, a broader audience can now see why Digger won, among other accolades , the 2012 Hugo Award for best graphic work and 2013 Mythoepoeic Award for best fantasy. Vernon brilliantly creates a typical hero’s journey for this atypical heroine, along the way touching upon universal characters and concepts that underlie some of today’s Halloween traditions. As Digger bravely moves further underground in quest of a legendary, imprisoned god-like figure, she must conquer her own doubts as well as natural and supernatural foes. Some of these are comic, such as the vampire squash that attach themselves to her legs, but most are not. By the time wounded Digger surfaces with proof of having released the eons-long chained prisoner, having demonstrated her right to return home as a fully-mature individual or ‘hero,’ she has confronted issues of spousal abuse and corrupt religious institutions. She has also come to terms with Vernon’s innovative versions of traditional Halloween figures and settings. There is a solitary “Shadowchild,” a demon hatched out of dead bird, trying to figure out what it is, and then trying to determine what is “good” vs. “evil,” since all by itself it has decided to be “good.” There are supernaturally gifted seers, one human and the other a slug, whose cryptic pronouncements Digger tries to follow on her uncertain path homeward. And there is a mysterious but kind social outcast (who just happens to be hyena); the fierce, matriarchal warrior clan who has outlawed him; and a brigade of self-righteous human priests determined to remove Digger, killing her if necessary, to avert sacrilege. The gods they worship include a version of the elephant-headed Hindu deity Ganesha. (I thought Vernon treated the embodiment of this deity with respect, depicting Ganesha as a truth-sayer and peace maker. Yet there is always the potential for misunderstanding or misrepresenting another’s religious viewpoint, and I am not Hindu . . . .) Gods and demons; sword-wielding, sometimes berserk warriors; masked seers and priests; haunted temples; and dangerously dark and spooky passages filled with unexpected, unknown dangers—all are frequently role-played and staged as part of today’s less-than-serious Halloween festivities. Vernon immerses us in Digger’s worlds through artful words as well as powerful black-and-white images. Digger is a fully-realized character not only through her stubborn actions and cantankerous dialogue but through expressions that convey her faraway home society. Exclamations such as “Dip me in chalk and call me a limestone conglomerate,” which we are wryly told is a saying that “flows better in the original wombat,” reflect the tunneling imperative and building skills that instinctively dominate that culture. Expressions such as “By the Great Architect!” serve a similar function. Digger also refers to historic wombat conflicts, achievements, and heroes related to her own family. This “humanizing” (for want of a better word) of Digger and her dilemmas is furthered by Vernon’s innovative illustrations. Danger, anger, and sorrow are all masterfully conveyed through shifting perspectives, varied panel sizes and shapes, and overlapping, unframed images and words. Black backgrounds, lined halftones, and multiple grey tones further extend Vernon’s emotional palette, as she also uses a variety of lettering to communicate shouts, squeals and background noises. Some enemies become allies, and a few enemies become more understandable, if still unlikeable. The complete omnibus edition of Digger also has interesting and fun back matter: a bonus story, published originally in volume one; short “reference works” about moles, trolls, and the cast of characters in Digger; and supposed random notes and lists “found” in the book’s supernatural realm after the events of its main story. Vernon includes as well her “(Famous) Last Words” as an afterword to this printed volume and a “Web Commentary,” her responses over the years to readers who had questions about the serialized, online version of this world-building, epic work. Full-color illustrations, originally the covers to the individually-printed volumes, are the final bonanza here. Younger readers (along with the young-at-heart) will enjoy Vernon’s ongoing series of illustrated and hybrid novels (part graphic novel and part text) about a grade-school aged dragon, Danny Dragonbreath (2009 – 2015). Its 5th volume, Dragonbreath: No Such Thing as Ghosts (2011) is set at Halloween, with a plot centered on trick-or-treating. 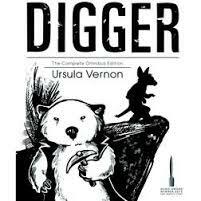 Yet I wholeheartedly recommend Digger: The Complete Omnibus Edition to those ready to tackle its ideas and heft. The “trick” of leafing through its 800-plus pages is well worth the “treat” they provide! This entry was posted in graphic novels and tagged All Hallow's Eve, Benjamin Dewey, cats, Charles Perrault, criminal mastermind, Danny Dragonbreath: No Such Thing as Ghosts, demon, Digger: The Complete Omnibus Edition, fantasy, Ganesha, Halloween, hero's quest, Hugo Award, hyena, I Was the Cat, Lloyd Alexander, Mythopoeic Award, nine lives, Paul Tobin, Time Cat., Ursula Vernon, warriors, webzine, wombat. Bookmark the permalink.